"Spire of Paris's 850-year-old Notre Dame cathedral collapses as 'terrible' fire ravages the historic building with flames erupting through the roof sending huge plume of smoke sweeping across the city"
"Officials say the blaze could be linked to renovation works as the spire has been undergoing a $6.8million renovation this year"
The rose windows are gone. It looks to be a near-complete loss of everything that isn't stonework. Just devastating. Stories like this mess with my head on twitter. Like.. Should I like the tweet about a piece of history burning? Should I not? Am I liking that it's burning? Am I liking the sharing of info? What do I do here? This is insane. I wish I could remember anything from when I went there as a kid because it looks like I won't get another chance. This is so sad, but I noticed the scaffolding immediately and I'd bet this stemmed from the renovation. In my town, we've had *much* newer buildings also have fire problems from renovation/construction work. Dammit God take the diddlers not the art. They're already pretty sure it's because of the renovation, from what I've read. In small victories, on a live feed they just reported that the artifacts within the treasury were saved. This is an important (tumblr) post that I could appreciate. Can agree with much of that. The rebuild is certainly going to be a proud event for France. I look forward to seeing the community aspect of that. Devastating, yet . . . beautiful in the destruction. Thanks for posting that. It made me feel better. I'm sure some of that post with the updates will change, and we've definitely lost things that held a lot of historical value, but . . . idk. It's okay to grieve, but also understand that this doesn't have to be the end. I’m lucky enough to have visited the Notre Dame Cathedral way back in the 90s. The thing that impressed me most were the beautiful and amazing stained glass windows. According to Kraken’s link most of those have survived. Tbh I would still go visit the place, burned up or not. If I ever make it over there. 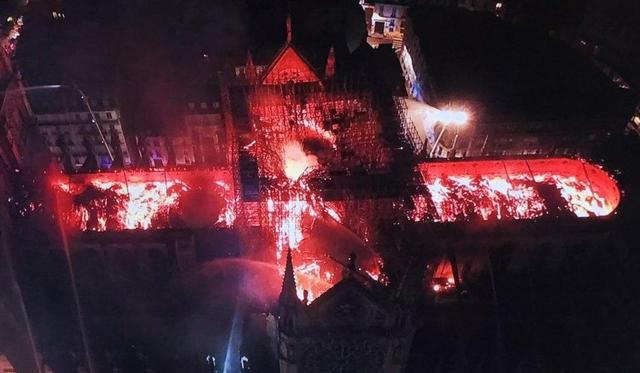 Don’t want to piss on your parade, but 20 minutes ago French authorities declare the fire was not yet under control despite 400 firefighters deployed, and there is a possibility that the cathedral cannot be salvaged. The next 90 minutes will be crucial, according to reports. Thing is, the stability of the building was already in jeopardy. My dad posted this on fb. They're claiming, on CNN from a french official - that both towers are safe for right now.